This is sad as we always liked to have a browse around the shop, although on saying that, we never really bought much, if anything. It was full of good ideas for the kitchen but if I’d bought everything I saw that was a ‘good idea’ (like special glasses to wear whilst chopping onions, I just use my sons swimming goggles, they work everytime) then my drawers would be so full I probably wouldn’t be able to open them. The cafe on our last visit (May 2018) was ok if I remember rightly, not as good as it used to be though and the mezzanine floor meant you bounced around everytime someone walked past. On our last two visits to Arundel I’m afraid to say we went somewhere different, Motte & Bailey in June and Butlers at Arundel by Candelight in December. 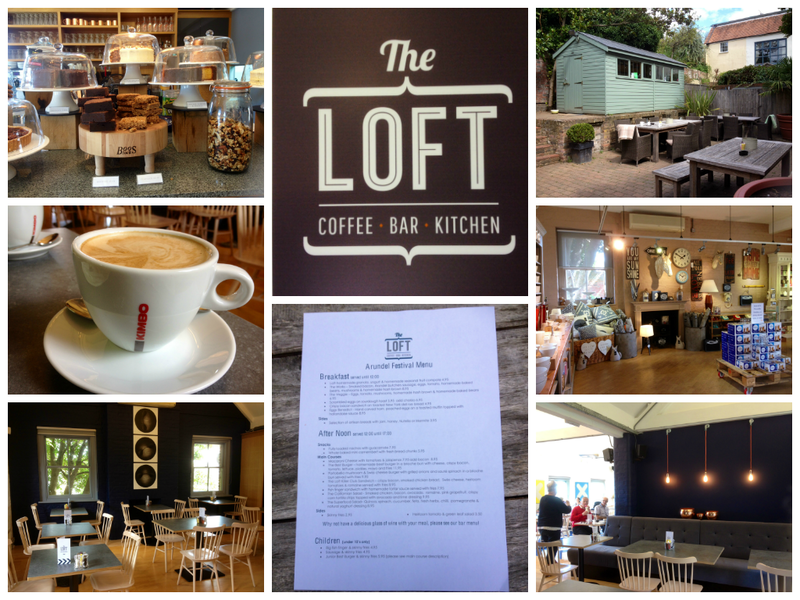 The Loft seemed to lose it’s ‘spark’ when they made the place bigger (this happens with lots of places) and moved the cafe to the top floor. 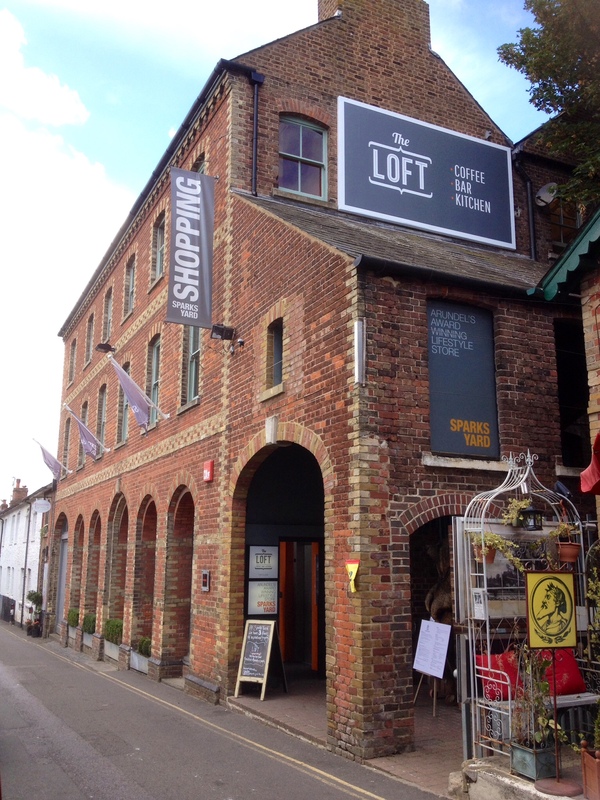 The Loft is on the top floor of Sparks Yard in Tarrant Street in the lovely market town of Arundel, West Sussex. 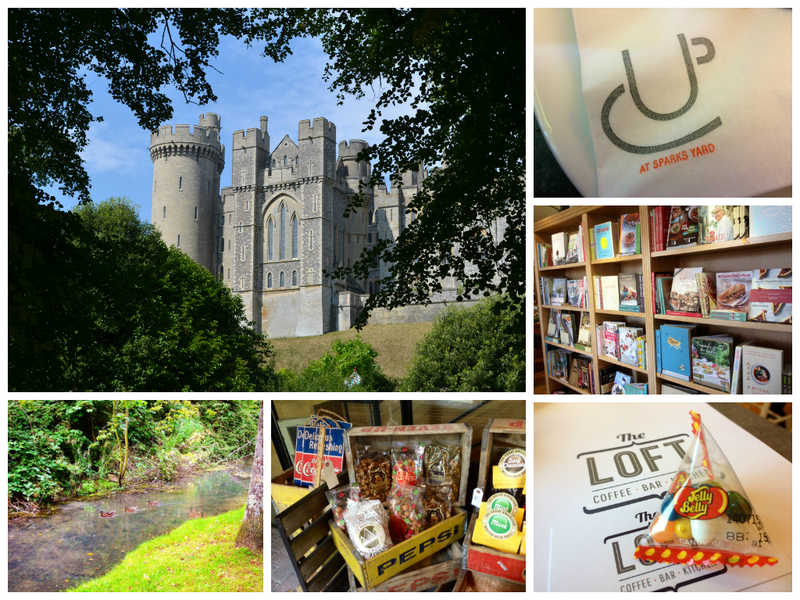 You may well remember the blog post on my favourite coffee and cake stops in Arundel. Well, Sparks Yard was one of them but recently they did away with their super cafe which was on the first floor, opened up the top floor and replaced it with suitably named The Loft. When we last visited Arundel – only about a month or two ago – we reviewed The Bay Tree just up the road. The Loft was in the process of being built back then and has been open for only 4 weeks. We were invited to go along to try out their menu. It was the start of the Arundel Festival so we booked in advance just to make sure we had a table. We arrived early so thought we’d have coffee and cake and then have a look around the premises before heading into the town. It was very annoying to find that I had left my SD card inside the laptop at home, just as I began snapping away outside, or at least tried to. I had to rely on my phone, which I must say took excellent photos, I thought. We were greeted by very friendly and helpful young waitresses and placed our order as we wanted to sit in the garden which was on the first floor, otherwise it’s table service. Alas, another couple had the only table which happened to have all the sun at that particular time of the morning. There were rugs however so we wrapped those around ourselves. Unfortunately, whilst we were waiting for our order it got a little too cold for us so we quickly made our way back upstairs. Inside the decor is very much on the same level as it was before, modern, clean and spacious. The copper light shades reminded me of The Artisan Café in Chichester whose shades are very similar. 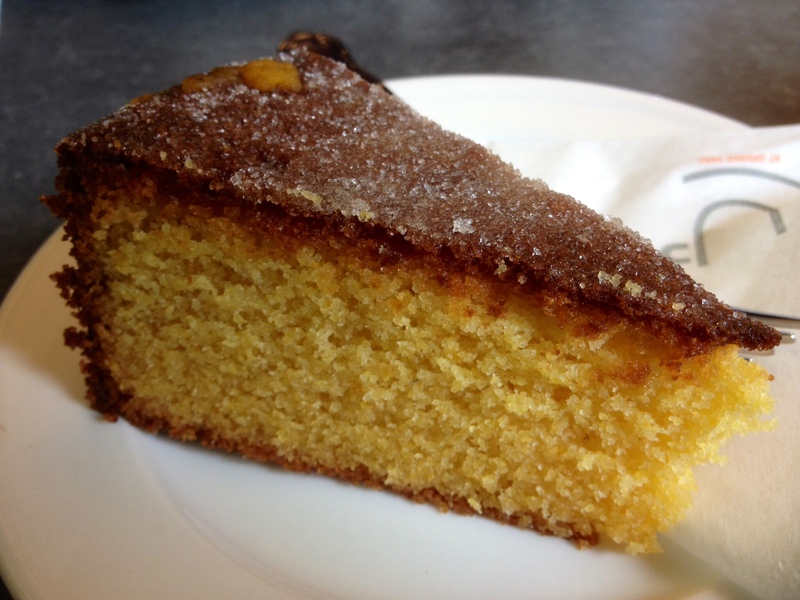 There were plenty of cakes to choose from but I went for one of my favourite, polenta cake. This was orange, almond & polenta cake. It was quite crumbly. I could taste the orange, although it was rather subtle, but unfortunately not the almond. 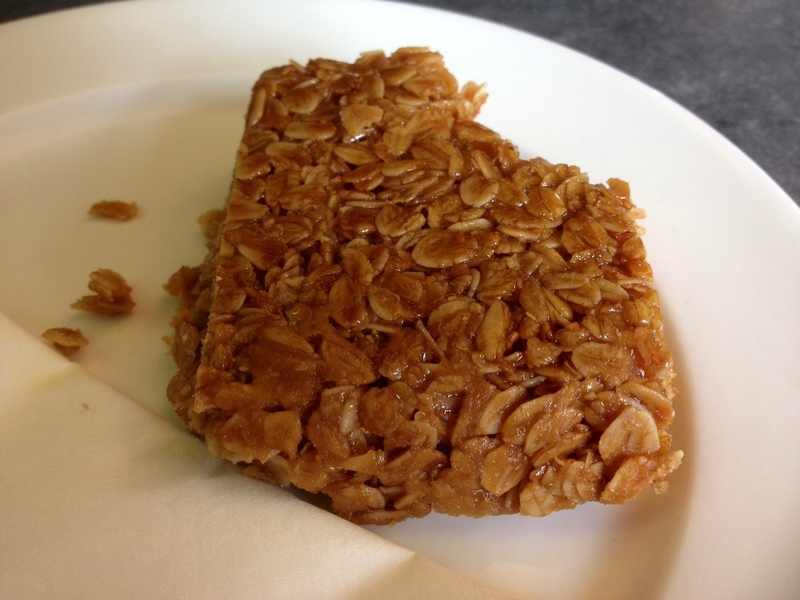 The cake was lovely and fresh and Geoff’s flapjack was nice too. It wasn’t a gooey, sticky flapjack like I make but he gave it the thumbs up. The flat white was very good. As we were leaving I asked if we could have the table by the window for when we returned for our late lunch booking. Afterwards we popped into the Arundel Brewery shop (they are by the river and the bridge) who not only sell beer, but also have a small selection of wines – until recently Sparks Yard had these premises with some of the same nik-naks you can find in their Tarrant Street shop. The couple who own it were very nice and knew the owners of The Loft. We sampled a wonderful Languedoc from Domain Cres Ricards and said we would return to buy a couple of bottles after our lunch because we didn’t want to lug them around with us. We then enjoyed having a mooch around the town and walking around the boat lake which reminded us of our childhoods. 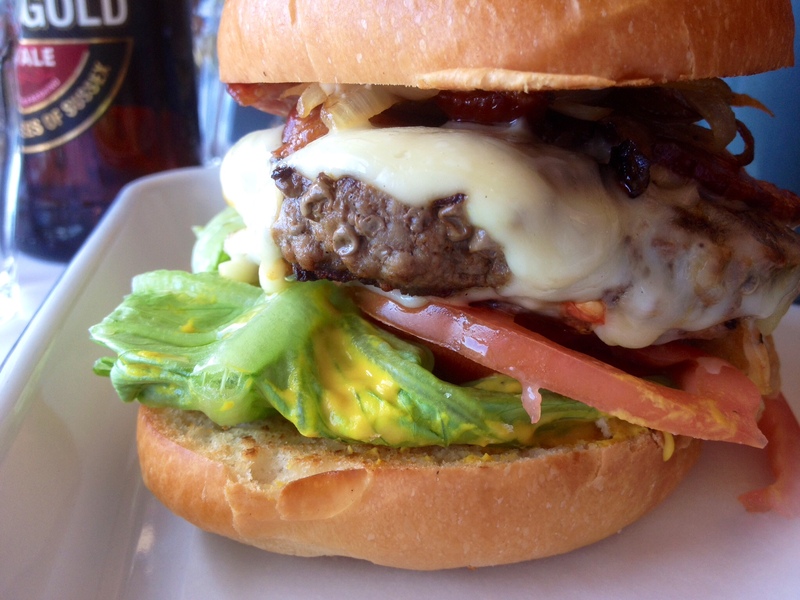 ‘The best burger’ – they may be right there. Upon our return to The Loft, we were greeted by the owner, Holly and shown to the table I’d asked for, which was beside a window which looked over the rooftops of Arundel. The menu was a smaller one than normal because of the Festival, a busy time for them. Also, as they’ve not long been open, they’ve kept it simple whilst the kitchen get used to it. Good idea. The more extensive menu will be introduced at a later date. To drink I had a small bottle of Prosecco whilst Geoff enjoyed a nice bottle of Sussex Gold, from Arundel Brewery of course. Holly’s husband Andrew who also runs the place, served us and chatted to us about the menu. We both chose the beefburger. 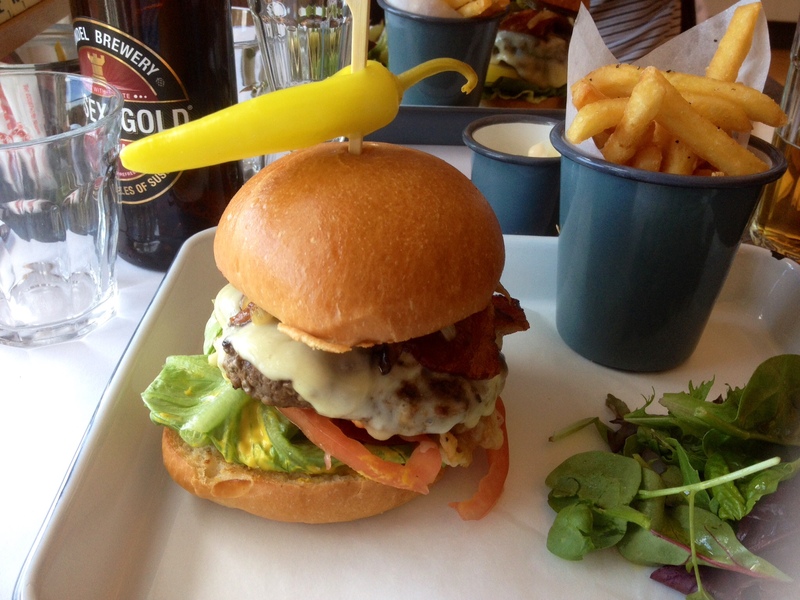 ‘The best burger – homemade beef burger in a brioche bun with cheese, crispy bacon, tomato, lettuce, pickles mayo’ and fries’. The beefburger was the best we’ve had in a long time. It was very tasty indeed with no fat or gristle. It tasted of a true, quality burger. The brioche bun was nice and fresh (as was everything) and apparently they had worked with The Hungry Guest bakery to develop it. 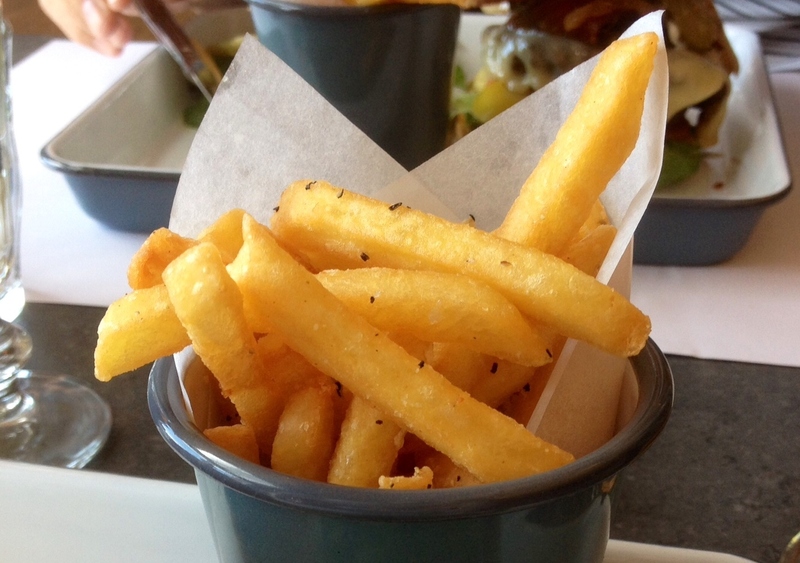 The fries were also good. All this was served upon a tin tray with edges which I wasn’t so keen on, but then I dislike wooden boards and slates too. I hated the paper underneath my burger which just got soggy, ripped and almost ended up in my mouth along with the food. I can’t argue with the fact that it looked good presented on the tray though. On the more extensive menu there was a dessert which I really, really wanted. Listen to this – ‘Rocky Road – chocolate ice-cream, marshmallow fluff (which is very sweet and gooey), mini marshmallows, cherries, biscuit crumbles, Hershey chocolate sauce, whipped cream’. Sounds truly amazing doesn’t it? There was another which Helen would love too, with Reese’s peanut butter chips. 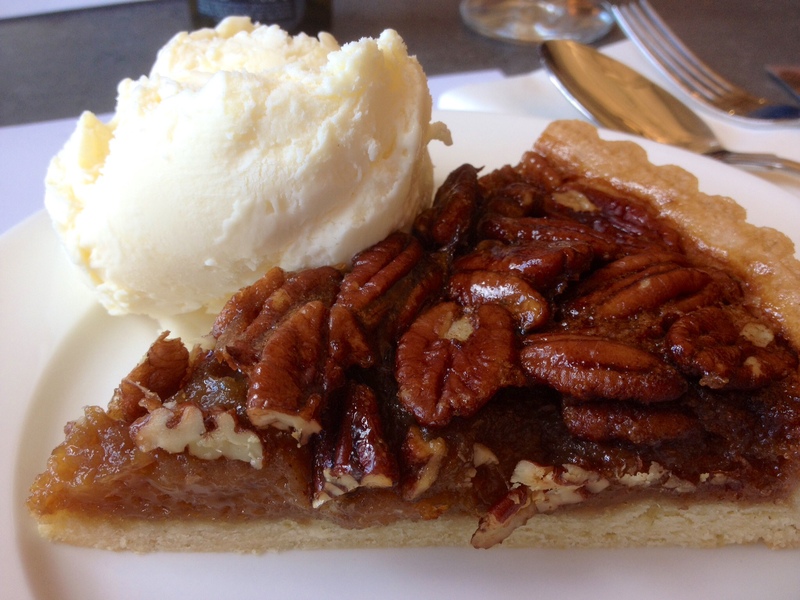 Anyway, unfortunately those weren’t available so we each had a slice of pecan pie which was served warm. It had a lovely sweet pastry base which was crisp around the edges, with a gooey centre and topped with loads of pecans. Geoff had vanilla ice-cream and I had white chocolate ice-cream which had thin shavings of white chocolate in it. Geoff’s not normally one to go for something quite so sweet but he said he enjoyed it and I did too. Afterwards I had an espresso which was very nice and didn’t make me pull a face. The Loft has free wi-fi which is great news for those of us who like to take photos of our food either tweeting them or putting them onto Instagram/Facebook. Music played in the background, Bill Withers ‘Lovely Day’, that kind of thing. The place was popular with all sorts, families, couples, friends. It had a lovely ambience and looks great. With the bill was a small packet of Jelly Belly beans which was a lovely little touch. I’m a sucker for things like that. On the first floor Sparks Yard has lots and lots of items for the kitchen. Things you didn’t realise you wanted or needed but now you’ve seen it, you simply must have it. Lots of cook books and baking books. Some American food items such as Reese’s and Hershey’s and lots of other goodies you won’t find in the supermarket. The bottom floor has greeting cards, different from the one’s you’d get on the High Street. Handbags, jewellery, baby gifts, smellies, something for everyone, even Geoff likes to have a browse. It really is nice to look around and as I said, it’s somewhere we always visit whenever we’re in Arundel and that won’t change. Full up, we headed back to Arundel Brewery to buy the wine and some beer. Disaster! Only one bottle was left of the wine we wanted. We purchased that one plus another which was recommended to us. We gave the good bottle of wine to Geoff’s parents on the way home – wasn’t that nice of us? They must have liked it as they’ve mentioned it two or three times since. 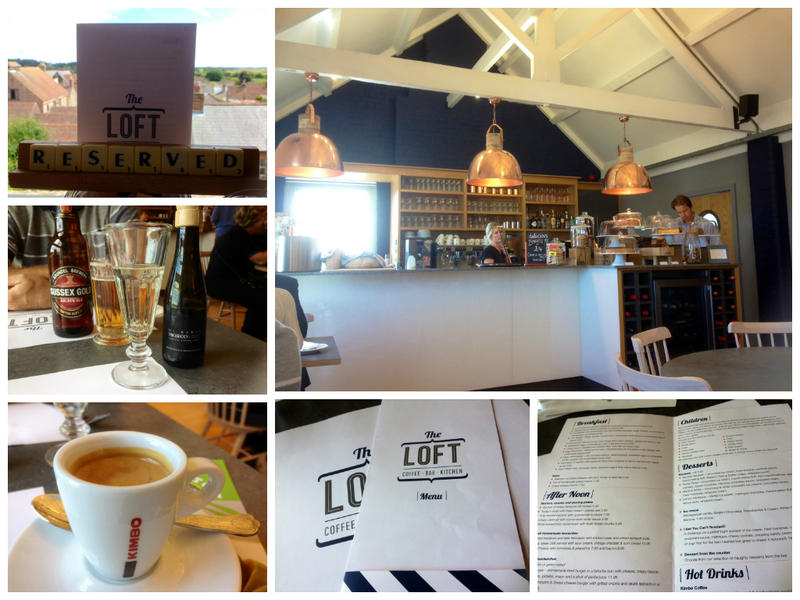 Whenever we find ourselves in Arundel we almost always visit The Loft. We did so again in August, the same time as the above review funnily enough, when the Arundel Festival was on. The main room was full so we sat in the area just off from it but the mezzanine floor is very bouncy in there so we had to move to a slightly less bouncy spot. The staff are friendly and the service very good. Geoff had the Loft morning Muffin I think which is a local sausage patty & local free range fried egg, topped with melted Monterey Jack cheese in a toasted English muffin but without the cheese – again with the daft paper underneath it. After he’d finished he found a circular hole at the bottom and asked me if that meant that he’d eaten that bit of paper, haha. My smashed avo’ on toasted sourdough and roasted cherry tomatoes was delicious. We were very disappointed with the chocolate brownie. I knew that the Hungry Guest used to supply them and I asked if this was still true to which the answer was yes. I’ve not seen them with white chocolate in before but this tasted not very good whatsoever and I’m guessing that they’d been frozen. I’m always banging on about how wonderful the Hungry Guest brownies are so this was not good. I’ve also had disappointing ones recently from Salt Cafe in Portchester who serve the same brownies. I find the best brownies around now are from The Chocolate Lab which you can find at any Coffee Lab who are dotted around the south of the country. We’ll still return though I’m pretty sure. We love Arundel.